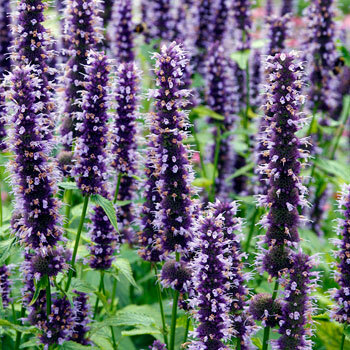 Agastache grows best in extremely well-drained, gravely soils, where it will be strongly upright in growth; rich, moist soils encouraging a more sprawling habit and a decrease in flowering. 'Black Adder' tolerates more winter moisture than some, but heavy soils should be amended with compost, sand and gravel. 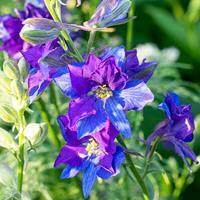 Plant in a mounded area to allow for the fast-draining necessary in winter, or grow in containers. If you must mulch, pine needles or a gravel-based mulch are best, as they do not harbor much moisture. Wait until spring to cut down to encourage its perennial nature. A pollinator friendly variety attracting hummingbirds, butterflies and bees, it also is unappealing to deer and rabbits and is seldom damaged by browsing. Seeds: Each flower might produce oval-shaped nutlets containing dark, tiny seeds. However, since this is a hybrid, seeds produced will not likely come true to type or may be sterile.